Two Catholic Priests were reportedly flogged mercilessly by masquerades in Enugu State. The priest were attacked and injured by masquerades in Ogbodu-Aba, Udenu Local Government Area, Enugu State. According to reports, Rev. Fr. Peter Chikwado Udaya, who is the parish priest of St. Patrick’s Parish Ibenda, and Rev. Fr. Daniel Tochukwu Akubue, the parish priest of St. Mary’s Parish Ada-Obollo, were going back to their parishes after a brief visit to St. Charles Parish Eha-Ndiagu. 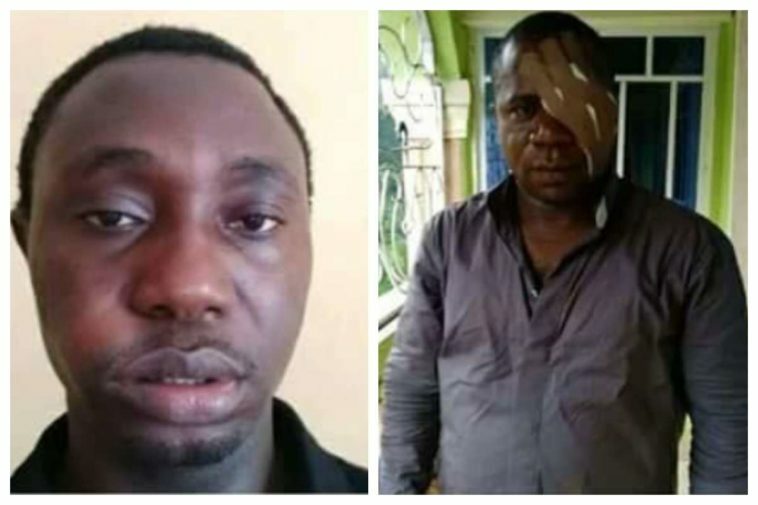 They were with the assistant Diocesan Liturgist when they were accosted by masquerades at Ogbodu-Aba on Thursday, July 12, 2018. A crowd gathered as the beating was taking place but they did not help, instead, they cheered the masquerade and the youths accompanying them on. The two priests were eventually rescued by Mr. Stephen Eze and his wife who were later said to have been ostracized by the community members. The attack left Fr. Chikwado Udaya with a lot of injuries and affected his eyesight. Since the ugly incident occurred, he has not been able to see with one of his eyes. He has already undergone an eye operation but the situation is still bad. Fr. Akubue Daniel was also severely injured.